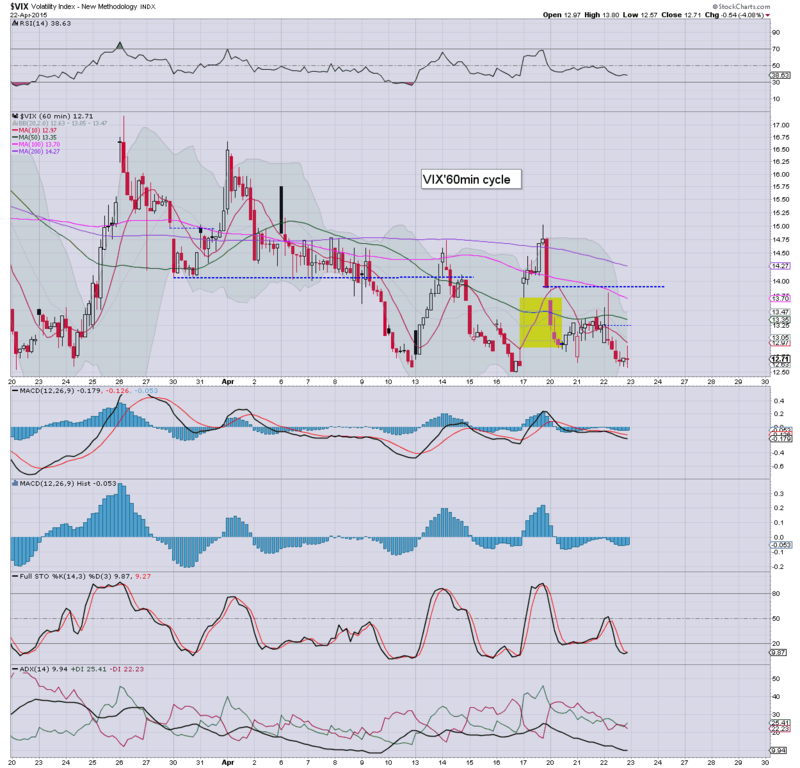 With equities closing moderately higher, the VIX continued to cool, settling -4.1% @ 12.71. Near term outlook is for continued equity strength, and that should equate to VIX remaining within the 14/10 zone into mid May. The big 20 threshold is out of range for some weeks. As the equity market becomes increasingly confident, and being almost entirely dismissive of a possible GREXIT, the VIX just keeps on melting lower. 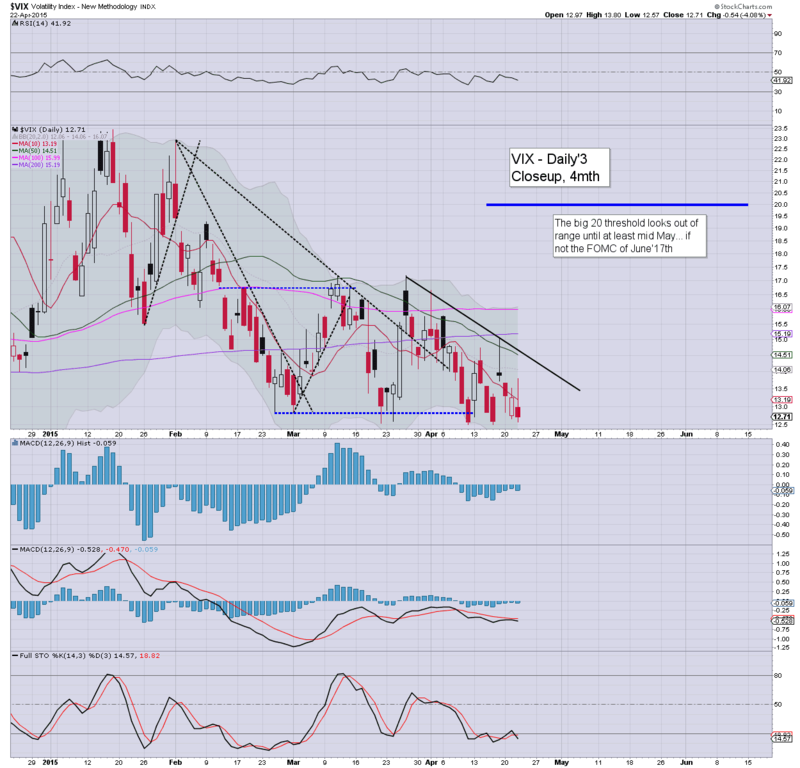 VIX 20s look unlikely until late May.. if not mid June. US equity indexes closed with moderate gains, sp +10pts @ 2107. The two leaders - Trans/R2K, settled higher by 0.5% and 0.1% respectively. New historic highs look due for all indexes in the coming days, at least to the sp'2125/35 zone. *awaiting FB earnings... amongst others..
... a very tiresome day... too many annoying technical problems today. 4.04pm.. FB EPS 42 cents vs market exp' 40. fractional rev' miss. US equities look set to close net positive, with the sp' somewhere in the 2105/15 zone. A break above key resistance of 2111 is possible in the closing hour.. but more likely tomorrow. Metals remain weak, Gold -$15... on its way to the giant $1000 threshold... possibly as early as June. *price structure for Gold/Silver remains a classic H/S formation. Once the Nov' of Gold $1130 is taken out, it will be a pretty straight forward (and possibly quiet fast) decline to $1000. It remains a case of no downside pressure, and Mr Market is clearly looking to take out a wheel barrow of short-side stops >2111. Whether that occurs before the close... tomorrow or not until Friday, should make little difference to anyone currently long. *awaiting FB earnings at the close, which will likely have implications for TWTR, the latter of which I am long. US equities continue to claw higher, set to break key resistance of sp'2111. Precious metals remain very weak, Gold -$14, with Silver -1.0%. Oil remains in minor chop mode, -0.3%. VIX is confirming the increasing market confidence, -4.5% in the 12.60s. It is difficult to say if the market will break above resistance of sp'2111 before the close... regardless, once it does happen, a wheel barrow of short-stops will get hit.. and market should see some acceleration to the upside. New historic highs are increasingly likely in the immediate term. Certainly, a weekly close in the 2120s looks very viable. A month end closing in the 2130s appears viable. notable gains: TSLA +5.6%... building gains.. having broken out of the downward trend. 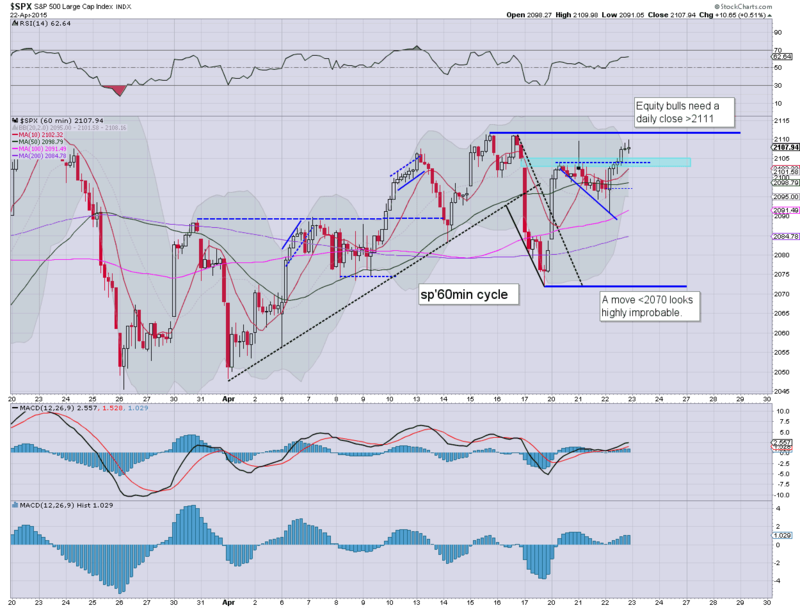 US equities continue to slowly battle higher, with the sp +6pts @ 2104. A key break above resistance of 2111 looks more viable tomorrow. Metals remain very weak, Gold -$14. Oil is seeing minor chop, +0.3%. 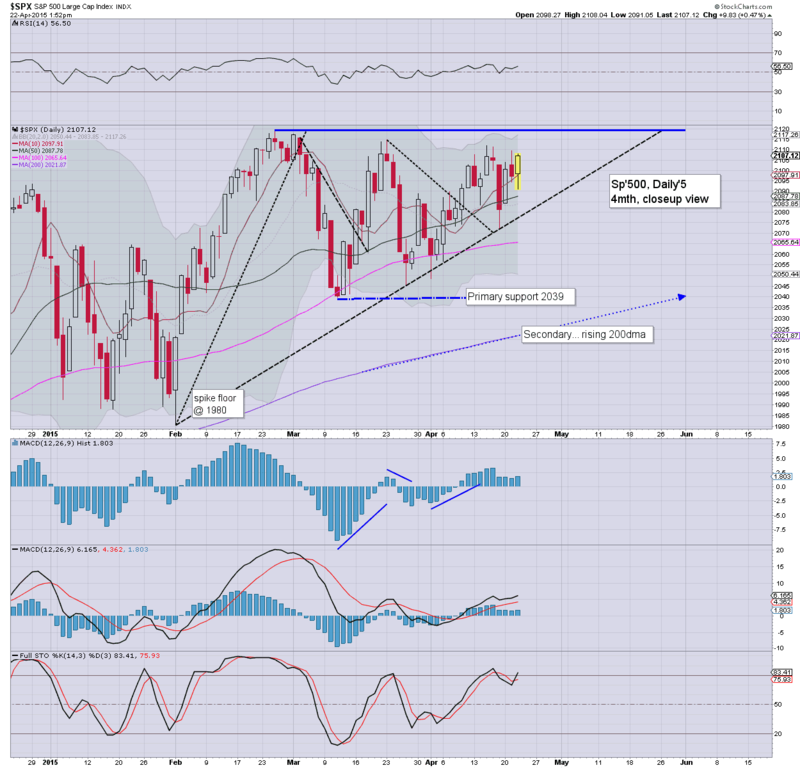 Market looks set for a net daily gain. Once 2111 is broken over.. the upward trend should accelerate a little as a wheel barrow of short-stops will get hit. The 2130s are viable in the immediate term. 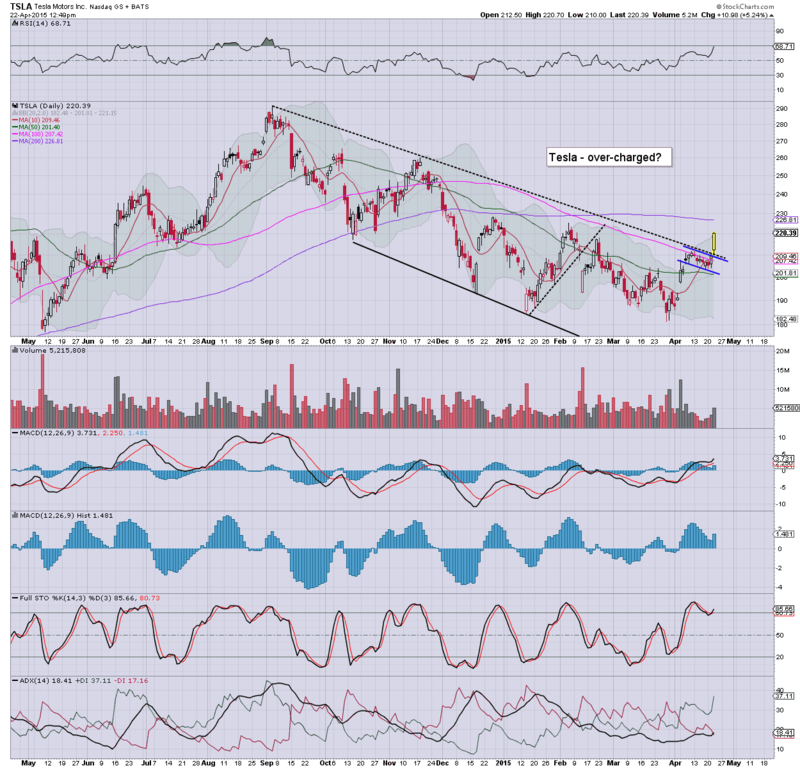 notable strength: TSLA, +5.2%... having a clear break of trend. The $240/60 zone looks viable within a few weeks. US equity indexes are holding moderate gains, with the sp'500 having swung from a morning low of 2091 to 2103. A break above key resistance of 2111 will be difficult today, but looks probable by the Friday close. Metals remain very weak, Gold -$13. Oil is seeing mixed chop, -0.1%. *price action in the metals is looking especially bearish, and the Gold bugs should again be very concerned of a violent snap lower if Gold loses the Nov' low of $1130. I remain looking for $1000 this summer, which will help make for a grander multi-year low in the mining stocks. 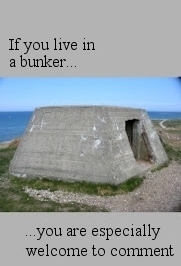 Little to add. 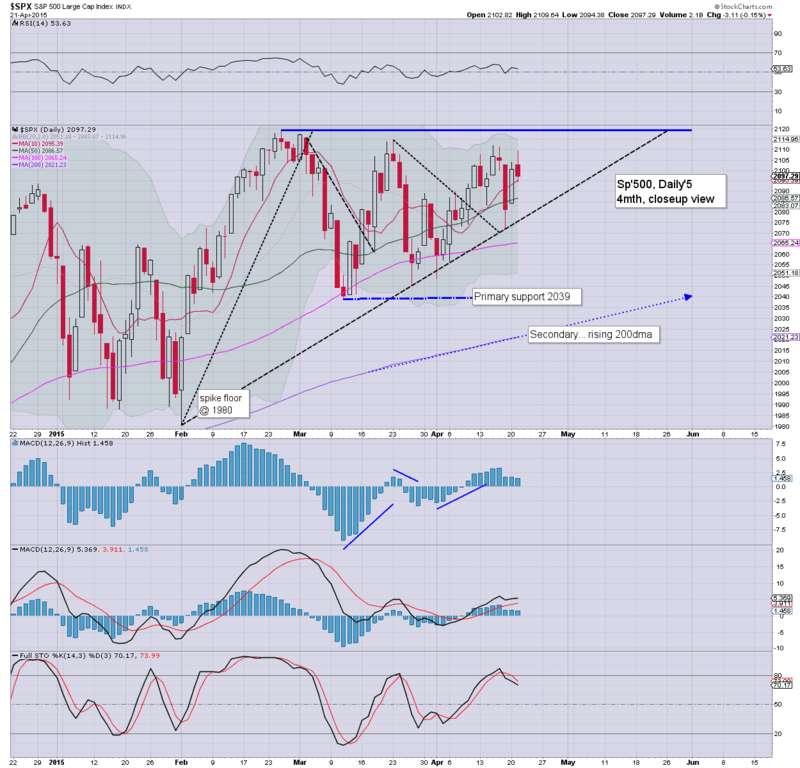 There is no downside power... equities look set to battle upward into early May. notable strength: TSLA +4.5%.. having broken above the descending trend from last Sept.
... battling to install some software... back soon! Another relatively subdued open... there remains a near total lack of downside power. A net daily gain for most indexes looks due. I see little reason (other than the wild card of adverse Greek news) for the market not to broadly climb into early May..
notable strength: TSLA +3.4%. Price structure recently is a bull flag... first target would be the 200dma in the $220s in May. 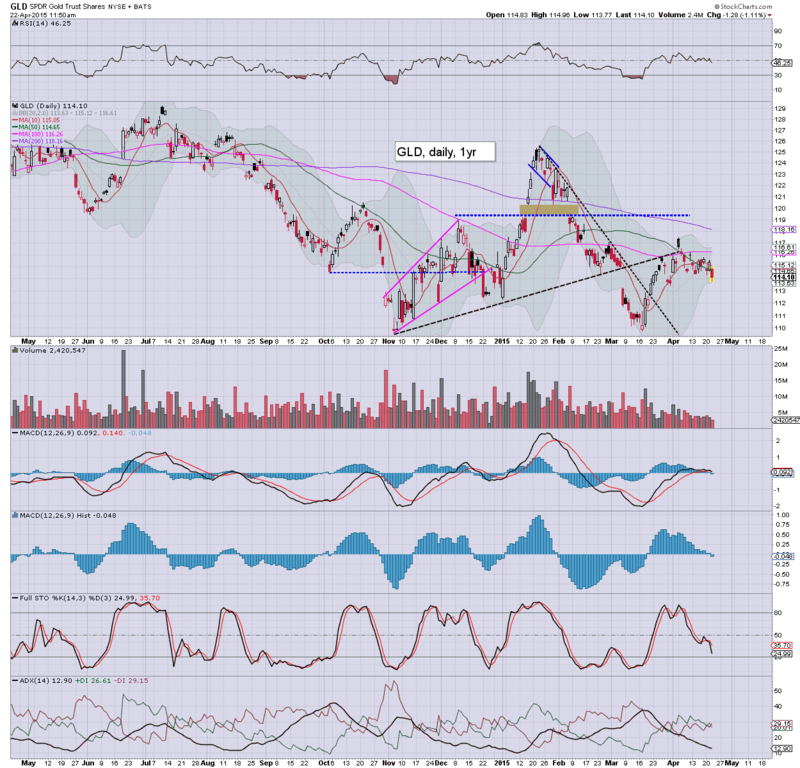 weakness: miners, GDX -1.6%... as the precious metals resume the broader downward trend. Good morning. Futures are a little lower, sp -4pts, we're set to open at 2093. Metals are a touch weak, Gold -$2. Oil is fractionally lower ahead of the latest EIA report, -0.1%. Opening minor weakness, but overall, its almost certainly just another little tease to the bears. Eyes on Oil today... with the EIA report at 10.30am. It'd seem - via yesterdays API report, that inventories will come in somewhere in the 3-6 million range... which should pressure Oil a little. 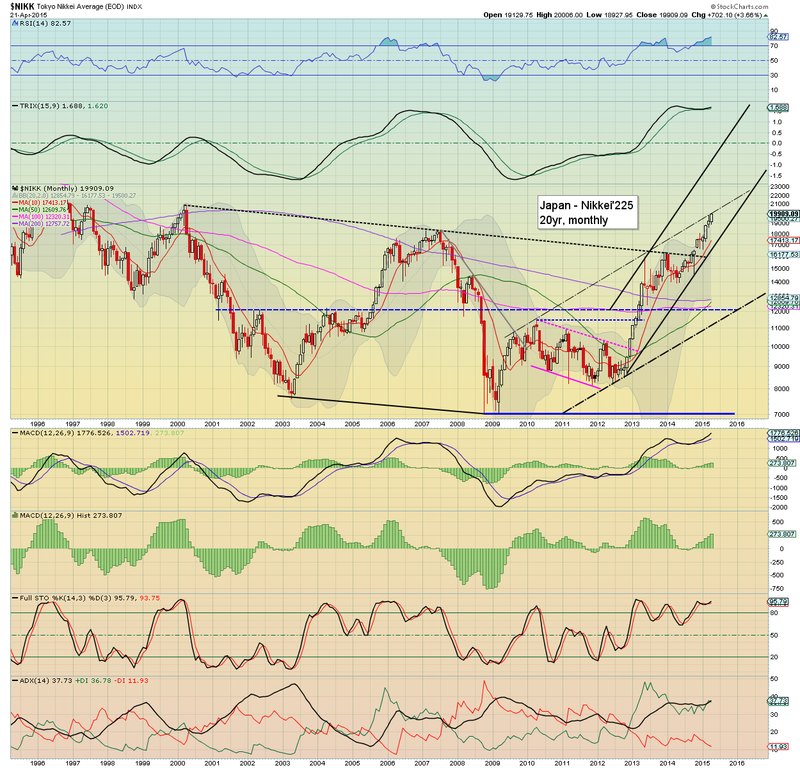 However, Oil still looks set for the $60s.. which is a clear 10% higher... and that will help the broader market in May. 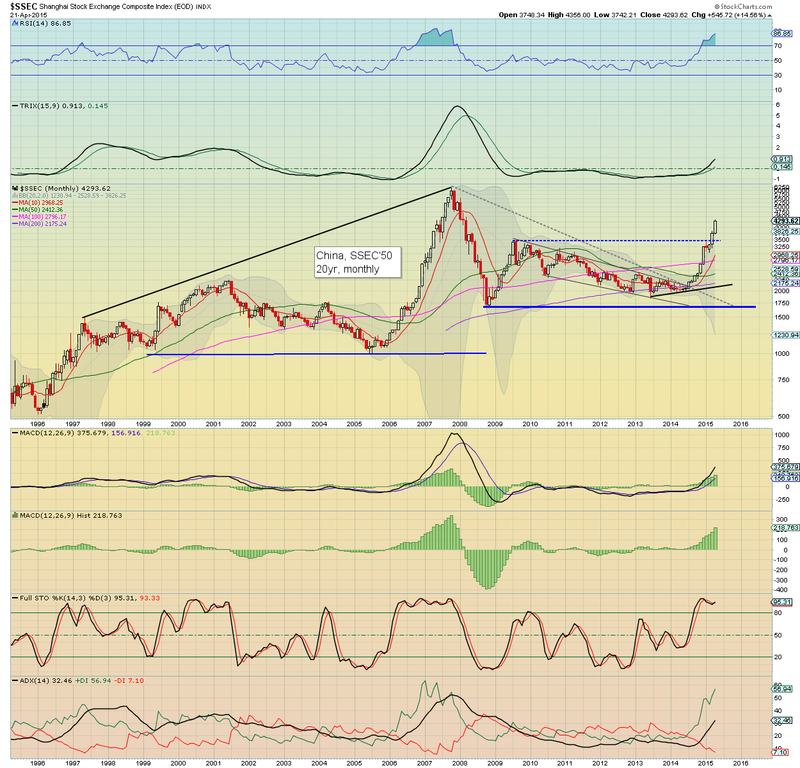 It is interesting that Acker' is seeking the DXY 120s... as I am. Although I am seeking a retrace first to 93/92.. perhaps even a little lower this summer, before a hyper-ramp.. as the Euro implodes later in the year. However, I completely disagree that any int' rate rise will kill the economy/system. Far from it... higher rates will help inspire confidence (even in the Fed itself). If you think negative rates are a good thing, then you really have fallen in love with Fed policy, and there is no hope for you! *Watch the USD... just need a break under 97.50... to break (sideways) out of the uptrend.. that stretches back to last May. In early trading, DXY -0.2%... @ 97.83. Good wishes for Wednesday trading! ... that is helping the Dow, which is now set to open +60pts or so. sp'500... now set for -1pt @ 2096. Whilst the US market is still battling to break a new historic high >sp'2119, there is relentless strength in Asia, with the Chinese and Japanese markets both powering upward. With the PBOC and BoJ periodically meddling to keep the bubble growing, there is little reason to not expect continued upside. 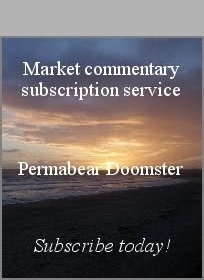 Suffice to say... absolutely nothing bearish in the near, mid.. or long term outlooks for China or Japan. The SSEC looks set for 5K before year end, although at the current rate, it might only take another 2-3 months!. 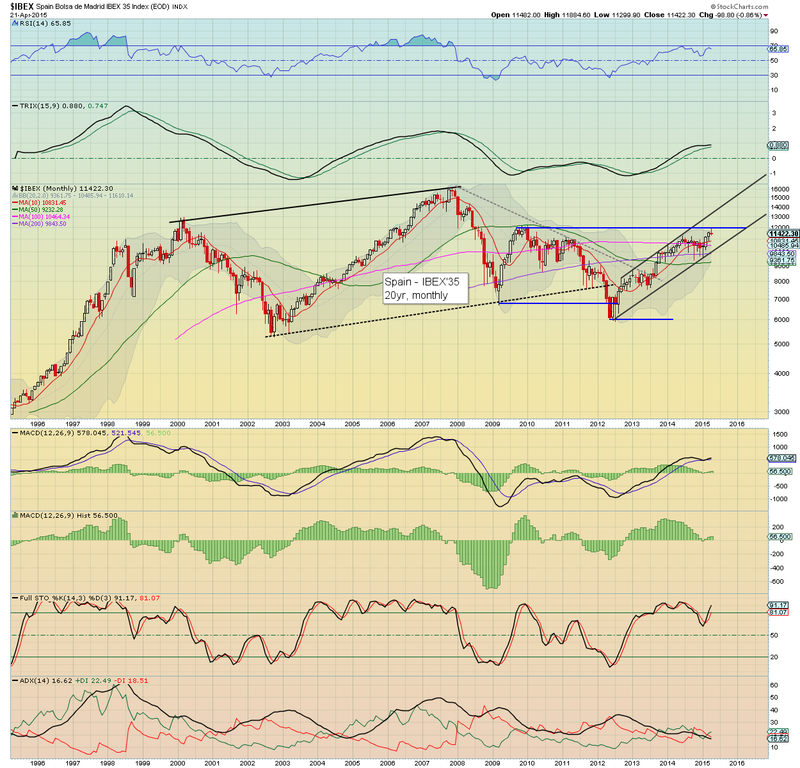 Meanwhile, we have the Nikkei around the giant 20k threshold, next level is the March 2000 'tech bubble' high of 20883. Indeed, the Nikkei and the US Nasdaq comp' are both set to break the March 2000 bubble highs within the near term. There looks to be a further 'comfortable' 20% before any chance of a sig' retrace. ... although I do expect a monthly close >12k some time soon. Once 12K is closed over.. next level is the historic high of Nov'2007 of 16040... a clear 35% higher. That looks viable within 6-12 months. Wed' will see existing home sales, the FHFA house price index... along with the latest EIA oil report. *FB will have earnings at the close, and that will likely also increase market attention on TWTR (earnings next Tuesday)... the latter of which I remain long. US equity indexes closed somewhat mixed, sp -3pts @ 2097. The two leaders - Trans/R2K, settled +0.2% and -0.1% respectively. 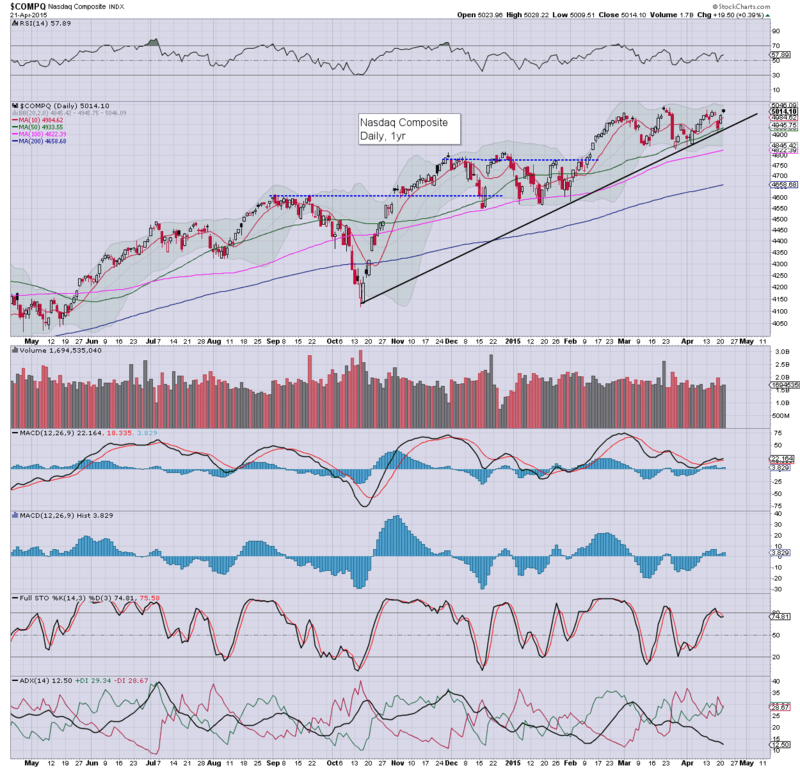 Near term outlook is for continued broad upside.. to new historic highs across all indexes. VIX continues to reflect a market that has little concern of anything. *notable strength in the tech, which settled higher by 0.4%. Daily candle was a black-fail, that is somewhat bearish. Most indexes saw a day of consolidation after the strong Monday gains. Renewed upside.. to new historic highs looks more probable than downside. Certainly, the key low of sp'2039 looks well out of range.